STAR WARS AFICIONADO WEBSITE: CLASSIC IMAGE: PEST REPELLER! 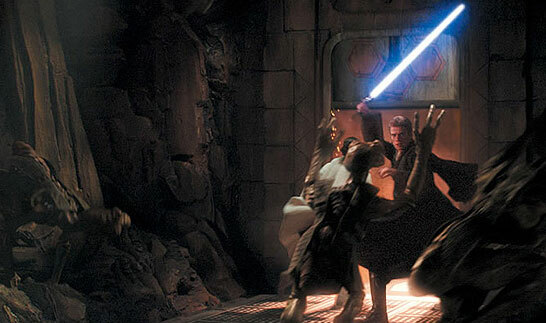 Deep in the bowels of Geonosis, Anakin Skywalker moves quickly to defend Padme from the sudden emergence of the planet's insectoid warriors, in a tense scene from EPISODE II. ROTJ AT 30: MADE-UP MAN MONSTER! ROTJ AT 30: BONE COLLECTOR! THE CLONE WARS: THE VIRUS IS LOOSE! CLASSIC IMAGE: MASTER LUKE, WHERE ARE YOU? CLASSIC IMAGE: PREPARING FOR TAKE-OFF! ROTJ AT 30: JEDI OBSERVER! CLASSIC IMAGE: WHEN 'EMPIRES' MET! BEHIND THE SCENES: PICNIC HUMOUR! CLASSIC ART: WHO'S THE DADDY?! ROT AT 30: THE LONELY EDIT OF MOFF JERJERROD! ILM CLASSIC IMAGE: AN X-WING MADE REALITY! BEHIND THE SCENES: WHO ME? ROTJ AT 30: OF EWOKS AND X-WING PILOTS! ILM CLASSIC IMAGE: SIDESHOW WAMPA! DELETED SCENE: REBELS? WHAT REBELS?